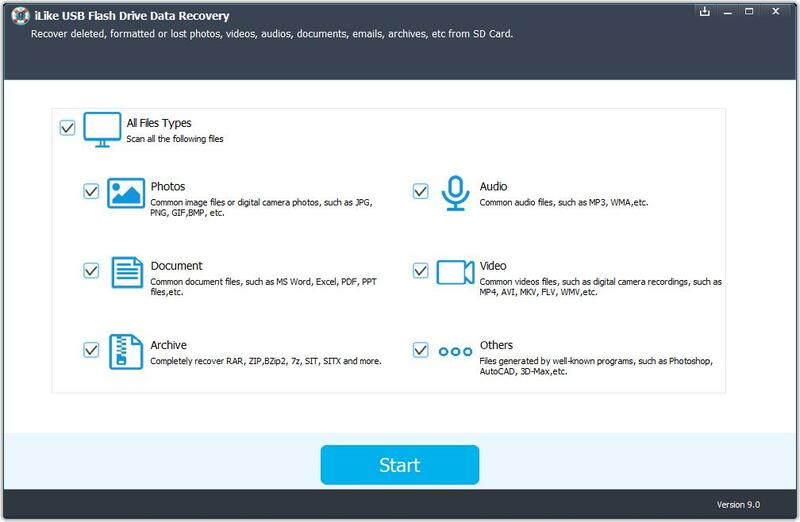 World's #1 USB Flash Drive Data Recovery Software to Efficiently Recover Deleted or Lost Data from All Types of USB Flash Drives Including Pen Drive, Thumb Drive, Jump Drive, Zip Drive, Memory Stick, Data Traveller, Handy Drive, Flash Drive, Key-chain Drive, Jet Flash Drive, and USB Flash Drive. Why iLike USB Flash Drive Data Recovery? USB flash drive storage has become a viable alternative to legacy storage devices due to a variety of factors: portability, improved power usage, reduced heat displacement, a complete lack of mechanical parts, ease of use, etc. However, data loss in USB flash drive has been common due to hardware failure, human error, computer viruses, power surges, natural disasters, or software/program corruption. iLike USB Flash Drive Data Recovery can recover deleted or lost data/files like images, pictures, audio, video, songs, music, clips, documents from flash drives including Pen Drive, Thumb Drive, Jump Drive, Zip Drive, Memory Stick, Data Traveller, Handy Drive, Flash Drive, Key-chain Drive, Jet Flash Drive, and USB Flash Drive.